Image from Amazon - you can order your copy of this book at the end of my review. Why have so many authors, known for their popular books, quoted the content of this book? What is so profound about his story and his insights? If these authors (12 of 51 authors to be exact) are quoting and referencing this profoundly meaningful book, then the question begs your attention… Have you read it? Viktor Frankl has gifted to us and no doubt, our next generation, a truly amazing insight into his life in the holocaust which he makes sense of how he and others coped and why people died. Part story, part therapy explanation and part ‘life’ instructions, who would have thought that this little book would and is still being read by so many people on earth. 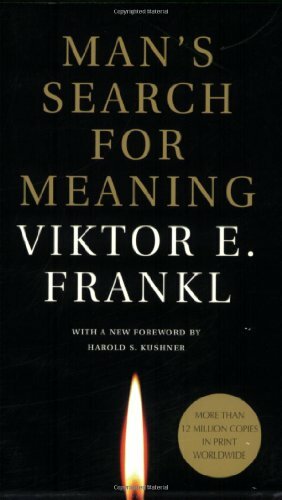 The most referenced book was Man’s Search For Meaning by Viktor E. Frankl. I thought I had read Frankl’s book by the time I did reach it at book number 48! Twelve authors quoted Frankl which shouldn’t surprise you or me as most of the books which I read revolved around people’s self-awareness and people’s development. I thought The Seven Habits of Highly Effective People by Stephen R. Covey would have been the most referenced book; yet, I was wrong. Covey presented many models, principles and requests whereas, Frankl shared poignant insights, explanations of his passionate therapy practice and precise life messages. · Life is not primarily a quest for pleasure (Freud) or power (Adler) but a quest for meaning. · The most enduring insight: forces beyond your control can take away everything you possess except one thing, your freedom to choose how you will respond to the situation. · You cannot control what happens to you in life, but you can always control what you will feel and do about what happens to you. · Happiness and success must happen – you have to let it happen by not caring about it. · Frankl had a chance to avoid concentration camp however he stood by his values, importantly his care and respect for his parents. He made a choice. · A man’s character became involved to the point that he was caught in a mental turmoil which threatened all the values he held and threw them into doubt. · The experiences of camp life show that man does have a choice of action. · Those who know how close the connection is between the state of mind of a man, --his courage and hope, or lack of them--and the state of immunity of his body will understand that the sudden loss of hope and courage can have a deadly effect. · Life ultimately means taking the responsibility to find the right answer to its problems and to fulfil the tasks which it constantly sets for each individual. · Mental Health requires a degree of tension – the tension between what one has already achieved and what one still ought to accomplish, or the gap between what one is and what one should become. What man actually needs is not a tensionless state but rather the striving and struggling for a worthwhile goal, a freely chosen task. · Emotion, which is suffering, ceases to be suffering as soon as we form a clear and precise picture of it. · Everyone has his own specific vocation or mission in life to carry out a concrete assignment which demands fulfilment. Unfortunately I can't recall where I sourced this image ... forgive me. The study of Logotherapy was Frankl’s passion and his manuscript of this subject was confiscated when sent to a concentration camp; his deep desire to rewrite the manuscript helped Frankl survive the camp life. Logotherapy is a meaning centred psychotherapy – (logos is a Greek word which denotes meaning) – focused on the meaning of human existence as well as on man’s search for such meaning. This striving to find a meaning in one’s life is the primary motivational force in man. The logotherapist’s role consists of widening and broadening the visual field of the patient so that the whole spectrum of potential meaning becomes conscious and visible to him. Logotherapy sees in responsibleness the very essence of human existence. – Live as if you were living already for the second time and as if you had acted the first time as wrongly as you are about to act now. Like so many people who recommended Man’s Search For Meaning, I am now recommending it to you. I believe I have a more determined focus on my life’s purpose. It’s helped me have a more profound contemplation and I am motivated to help others discover this powerful point – we all have a choice in how we respond to situations. It defines us. I hope it helps you too. I work with people to develop their leadership. I mentor, coach, facilitate workshops and speak about leadership. I have acquired so many new development opportunities and exercises discovered in my recent reading challenge and I look forward to sharing these with you.